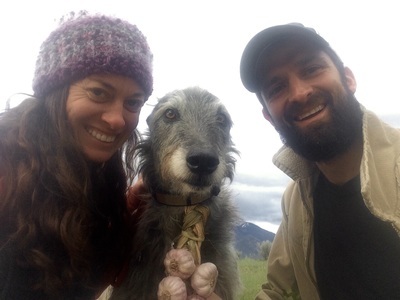 Every year, Ben Ronniger, who grows garlic in northern Idaho near the Canadian border drive south all the way to southern Baja California to escape the winter and to help a little village grow and harvest and braid their crop of Organic Baja Morado garlic grown in volcanic soil. They purchase enough to fill their bus This provides a valuable cash crop for the village and an economic opportunity for Ben and Kelly to bring some of it home at a time when fresh garlic is otherwise non-existent. Everybody wins. 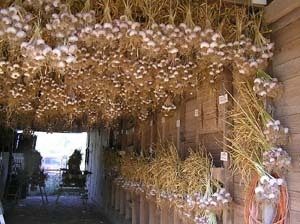 Get some really excellent long storing Silverskin garlics at a time when there isn't any fresh garlic anywhere else. Harvested at their peak and cured properly for long storage and carefully packed in the Little Red Bus that could for home in Idaho up near the Canadian border, where they grow Porcelain and other hardnecks. Gourmets everywhere are learning the tender joys that scapes are but can't find them. 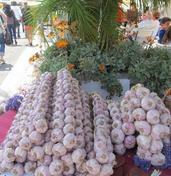 Well, there are available through the growers in the online farmers market but only in the spring when they are fresh. They are delightful when you consider that most bulbs deteriorated months ago and there has been no fresh garlic available and will not be until August except for Allicin's ranch's bulbs and braids from Baja.